This morning news resurfaced that President Obama had eaten dog meat as a child in Indonesia. Obviously, after Democrats gave Romney a hard time about traveling with his dog in a crate strapped to the roof of the car, this was too tempting for Republicans to resist hitting back with. Not that I agree with our president on much, but I do have to say that if I ever ran for public office, the media might pick up on a similar story from my past. When you’re living in a foreign country, you obviously want to experience the local culture and immerse yourself. (Within ethical, legal, and moral considerations of course). While living in Asia, I soon learned that dog meat was a delicacy and that people still enjoyed it. In South Korea, where I lived for a couple of years, while feasting on dog meat was becoming less common as the world globalized, it was still popular. My friends there told me that when Seoul hosted the 1988 Olympics, local authorities required restaurants selling dog meat dishes to get licenses and to take down signs with pictures of dogs on them (to avoid offending foreigners). There are still restaurants with photos of puppies on them, to let you know that they serve dog meat there, and even I admit that those pictures kind of freaked me out. As my friends pointed out, however, in some cultures they consider it strange that Americans eat cows. As well, according to my friends in Seoul, the dogs raised for dog meat dishes are not the cuddly, cute puppies we tend to picture or adopt as pets. They are a specific type of breed bred for eating, much like cows are bred and prepared for consumption. I still wasn’t crazy about the idea of eating dog meat, but I told myself when I moved to South Korea that I would be open to cultural experiences. Before I left Seoul, some Korean friends from my church told me that I needed to at least try dog meat before I departed. They took me to a small place in the city that was known for its boshintang, or soup with dog meat. I would be lying if I said that I didn’t feel guilty when we sat down on the floor to begin the meal. In the end, dog meat tasted–in my opinion–a lot like lamb, and even had a similar consistency. It was a little tough, but with the vegetables and other ingredients in the soup, it wasn’t that bad. I was told that Koreans eat boshintang for energy (especially men), because the meat is very high in protein. So, not that I ever saw myself sticking up for our president, but I can empathize that when you’re in a different culture you sometimes do or eat something that might be puzzling to your native culture. Not that I’ll eat dog meat again, but I don’t regret trying it in South Korea. (I’ll still take a burger any day though). Indeed, who knew that January 24th was a day set aside to celebrate that delicious, stick-to-the-roof-of-your-mouth concoction that is made from peanuts but isn’t really butter? I didn’t know this before doing some research, but peanut butter was apparently created in a raw form in 1890 by Dr. John Kellogg (the same Kellogg of the corn flakes company) as a way for patients with no teeth to get their protein. Years later, Dr. George Washington Carver developed a better tasting version of peanut butter, and in 1922 it was commercialized by the Rosefield Packing Company in California. Today, over half of American peanuts are used to make peanut butter. Growing up in Texas, peanut butter and jelly sandwiches were consumed by probably 95% of the kids in the elementary school cafeteria. This was, of course, before peanut allergies have apparently become commonplace; it seemed like everyone’s mom packed them peanut butter sandwiches for lunch. There were even debates at the table over which type of jam was better with peanut butter (I voted strawberry, while most of my friends said grape), which texture was better (crunchy for me, creamy for others), and which brand was tastier (Skippy for me, even though at home we mainly had Jiffy or Peter Pan). It was a staple in our young diets. Peanut butter was also a necessity for anyone going through a lean economic time, whether in college or starting out in the professional world. When I first moved to D.C. and spent most of my first paychecks on rent, I lived off of peanut butter sandwiches (without jam–that would have been an extra $5!) for ten days straight. By day eleven, I couldn’t handle it anymore and took about a six month sabbatical from peanut butter. Nowadays, I don’t eat that much peanut butter, but whenever I travel for extended periods of time I find myself craving the stuff like crazy. When I interned in Rome for a summer, I was introduced to the European equivalent of peanut butter, Nutella, and quickly embarked on a love affair with the chocolate/hazelnut spread. To this day, I love Nutella (although it just doesn’t taste as good when you buy it in the States–it’s creamier in Europe), but there is still a subconscious void when peanut butter isn’t around. As an American, it’s part of our culture. So, to keep my American roots intact, there were days when I made Nutella/peanut butter sandwiches for lunch in Rome (thank goodness for care packages from the parents). Living in London also brought up peanut butter cravings, mainly on account of the lack of it. I found myself missing Reese’s peanut butter cups, Reese’s pieces, and jars of Skippy, which seemed ridiculous because, as much as I love my home country, let’s face it–the Europeans do chocolate and confectionary sweets better than anyone. So, I tried to enjoy the local sweets but also enjoyed indulging in peanut butter whenever a fellow expat would bring a jar over from a visit home. During my time in South Korea, I discovered quickly that while Koreans were developing a taste for American sweets, they weren’t crazy about the creamy thickness of peanut butter. Once again I found myself daydreaming about a big peanut butter and jelly sandwich, often while I was enjoying my lunch of kimchi and rice (healthier, to be sure, but certainly not delicious with chocolate). Now, living in D.C., I admit that I tend to take peanut butter for granted once again. It’s becoming more “hip,” though, and many recipes nowadays incorporate peanut butter into more grown-up dishes. They all sound delicious too–peanut butter pancakes, peanut butter cupcakes, peanut butter cheesecake, and so on. There’s also the classic, tried-and-true American snack of peanut butter on apples. Peanut butter certainly has its place in American history and culture, and if you ask most kids who grew up in the States, it holds a nostalgic element as well. There’s something comforting, even to this day, about having a peanut butter and jelly sandwich. I almost feel like I’m back in the school cafeteria, talking with the other kids about the pressing matters of the day (homework, does Joey like Emily, when is recess today, and so forth). In the end, I guess it does make sense to have a day set aside to honor peanut butter. Before I moved to Maryland recently, I hadn’t really spent much time in the state. I’d been to Baltimore once or twice for a baseball game or something, but that was about it. Once I moved to Silver Spring and Leon moved to Laurel (we’re planning on being in the Maryland area for the next year), however, it felt appropriate to do some more exploring. Last weekend my mother was in town visiting, and I was trying to think of something fun for us to do in a place I’d never been before. Leon and I decided to take her to check out the antique shops in Annapolis and then drive on to Kent Island to eat the famous crab cakes at The Narrows restaurant. I must admit that my first impression of Silver Spring was, well, not the greatest. In its defense, the city has undergone extensive efforts to open up new restaurants and shopping centers, and they are doing a pretty good job. However, there are still parts of Maryland that even locals will tell you are pretty rough. So I was pleasantly surprised that as we began to drive up to Annapolis, it was nothing but beautiful foliage and lush forests. I was eager to see what Annapolis was like. Annapolis is, of course, known for the U.S. Naval Academy, which has a lovely campus. We drove around the capitol building, which is surrounded by quaint little streets with even quainter shops. We stopped into Blue Crab Antiques and Evergreen Antiques, both filled with treasures. I picked up an antique coffee table for a steal, while Leon walked away with a walnut side table and my mom scored a unique candelabra. After that it was time to head to Kent Island to make our reservation at the Narrows. I think that my favorite part of the outing was driving across the Chesapeake Bay Bridge–you were literally driving over the water for about ten minutes before “landing” on the island. The Narrows looked very much like a New England establishment where one could acquire some great seafood, and it did not disappoint. The Narrows is well known for its cream of crab soup and lump crab cakes, and being big fans of crab, we ordered the soup for appetizers and crab cakes for our entrees. I swooned immediately after trying the cream of crab soup; the words that came to mind were “rich,” “thick,” and “savory.” It was delicious. 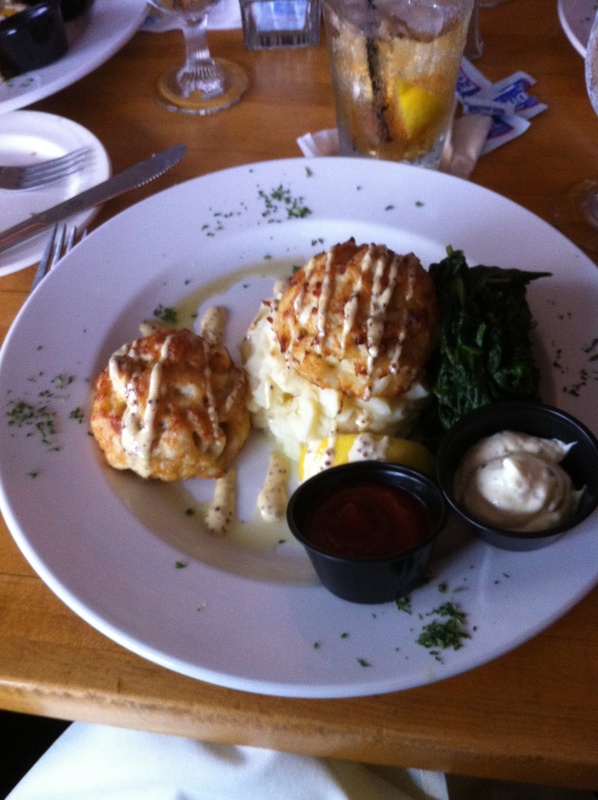 The same can be said about the crab cakes, which had enormous pieces of crab meat crafted into perfectly breaded portions. Add all of this together with the beautiful ambience of looking over the water, and it was a fantastic dining experience. Our dinner was finished off with a seasonal peach cobbler, and we were all stuffed to the gills. It was then time to drive back south, back over the Chesapeake Bay Bridge and back towards the more industrial, gritty city section of Maryland. From the outing, I found a new appreciation for my temporary state of residence. It only took about an hour to drive from Silver Spring to Annapolis, making it a great option for day trips from the D.C. area. If you’re looking for small town antiquing with a New England twist, polished off with some great seafood, Annapolis and Kent Island are calling your name. Rejoice, my fellow Americans–Thursday, July 21, 2011, is National Junk Food Day. What a fabulous concept, to have a holiday that celebrates all of our guilty pleasures. Now granted, I try to eat my vegetables and exercise like a woman conscious of the fact that 30 is looming in the distance, saying, “Your metabolism is mine!” With that said, however, I have many vices in the form of junk food (or what I like to call, treats). Treats, as I like to say, make the world better. Let’s face it–after a long, tough day at the office, or just a crazy day in general, a carrot just won’t do the trick. I also began to think about my favorite treats from around the world, and I’m a little embarrassed to admit that they are ubiquitous. I tend to form treat “obsessions” wherever I’m living or traveling, and they form the bulk of my cravings when I need a reward or when I make up a reason to have a reward. These days in D.C., for instance, my food obsessions have been (and often eaten together, but don’t judge me) crab legs, fried pickles with ranch dressing, and key lime pie. Those three things right there are my fantasy come to life, a perfect pigout feast that you dive into when you’re not counting calories, or when you’re trying to gross friends out. I also love to hit my favorite frozen custard place, Double Dip in Frisco, Texas, when I’m back in the Lone Star State. While most people in front of me order things like vanilla frozen custard with strawberries or something to that effect, I tend to shock and awe (or disgust, but same difference). Whenever I stop by Double Dip, close to my hometown of McKinney, I pull out a Post-It and write down everything I want thrown into the frozen custard blender. The owner started saving my Post-Its, funnily enough, and keeps them on the wall–the last time I drove through with my Post-It ready, the employees all ran up to the window to get a look at “the Post-It girl from D.C.” I’m sure they also wanted to see if I weighed a million pounds. I could go on and on, but I’ll stop there (it’s very eye opening, and somewhat humbling, to realize that you’ve almost literally eaten your way around the world). This year I’ll be celebrating National Junk Food Day in Washington, D.C., so I won’t be able to grab a favorite treat from an exotic location, but the nation’s capital is definitely a bastion of classic American goodies. So raise your French Fries and milkshakes, cut a deal with yourself to hit the gym sometime tomorrow as well, and have a happy National Junk Food Day! So it’s Friday, and everyone in D.C. is looking forward to the weekend (well, except for my friends who work on Capitol Hill–their weekend will be spent trying to help their bosses solve the debt ceiling crisis). I, however, found myself wondering where Leon and I would go for our dinner date tonight. Would we hit a new place in D.C. that we’ve never tried before, or would we go to an old favorite? The Old Ebbitt Grill is a Washington, D.C. staple. I went there often as a young intern in D.C. back in 2005, funnily enough during the time that Leon worked there during law school (we joke that we probably passed each other constantly but were busy doing other things and didn’t notice each other, just like in the movies). The Ebbitt has served as a special place for me in D.C., not only as an intern, but also as a young professional starting a new job in D.C., and now as a woman who has lived in D.C. for two years and is now engaged to a former employee. I’ve hit the Ebbitt for lobster with my mother and grandmother, spent hours chatting with friends over crab cakes, and shared desserts on double date nights with Leon and our friends Chris and Rose. The Ebbitt is literally down the street from the White House, so it’s located right in the heart of downtown D.C. When you walk in, you are greeted by a marble entrance and antique wood everything. It’s comfortable though–it has the feel of a cozy lodge, but with prices that even interns are okay with, and food that keeps you coming back for more. I’m not the only one who adores the place–since it was established in 1856, the Ebbitt was frequented by Presidents Grant, Cleveland, Harding, and Teddy Roosevelt. It’s known as Washington’s oldest, most historic saloon, where famous political figures from the past met to discuss pressing matters. To this day you might sit next to a political hotshot (or an aspiring political hotshot) enjoying some comfort food. By comfort food, I mean comfort food from all genres. The Ebbitt is famous for having the best crab cakes in all the land (they use giant chunks of fresh crab meat instead of heavily breading smaller pieces like lots of restaurants), and they have a famous oyster bar as well. During lobster season, you can get a Maine lobster for less than $20. As a Texan used to paying a lot more for a succulent lobster dunked in melted butter, I thought that I was hallucinating when I read the price for the first time. Besides great seafood, the Ebbitt has everything from juicy burgers to cheesy pasta dishes to flavorful ethnic dishes. My usual order is the crab cake sandwich or the crab cakes, but everything else I’ve tried has been wonderful, from the hummus appetizer to the Portobello mushroom sandwich. They do a great brunch too, with fantastic offerings like country brunch plate, ham and bacon stuffed French toast sandwiches, and fresh strudel. I also had a wonderful brunch of Eggs Chesapeake there (and I don’t even like poached eggs). And of course you can’t forget my favorite course, dessert. I love ordering a cup of coffee at the Ebbitt to go with a slice of cheesecake, creme brulee, peanut butter pie, strawberry shortcake, key lime pie, and so forth–and then taking a scenic walk around the sights to burn off calories afterwards. If you’re looking for a really cool, historical place to go in D.C., with great food and located close to that famous white house on Pennsylvania Avenue, I definitely recommend the Old Ebbitt Grill. Now my mouth is watering–is it dinner time yet? During the summer months, when the days are longer and warmer, I find myself craving lighter food (my mother would be proud of how many vegetables I eat, willingly, when temperatures spike). When it’s hot, you feel sluggish anyway, and a big salad with crisp veggies sound much more appetizing than a piping hot bowl of soup or something. Today was certainly no exception–as of this afternoon, the temperature hit a balmy 95 degrees in Washington, D.C. Now, in my homeland of Texas, this is common for the summer months. In Texas, however, I tend to get around more in cars and usually hop from one air-conditioned location to another. Getting around in D.C., on the other hand, is a different story. I usually take the Metro to work, and if I need to grab lunch outside of the office or run errands after work, I have to brave the elements and walk everywhere (or run, as I did recently when a lightning storm hit and I didn’t have an umbrella). At work today, thankfully in my air conditioned office, I read a great post on D.C. food trucks by my friend Lisa (a.k.a. http://www.thenovicenosher.com) and was inspired to think about my favorite summertime meal. (Food trucks, on a side note, are all the rage now in D.C., for good reason–gourmet cuisine, from cheesy macaroni and cheese to Chicago style pizza to lobster rolls, all available at your fingertips around the city). 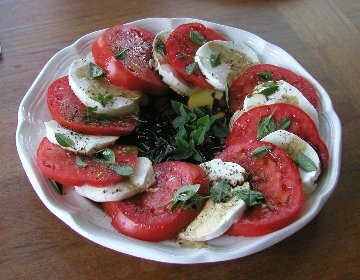 Although not available through D.C. food trucks, my favorite summertime meal, by far, is a big plate of insalata caprese. I first experienced the culinary delight of insalata caprese while living in Rome, and I’ve been obsessed ever since. Insalata caprese translates as “salad in the style of Capri.” It’s apparently unknown if the salad actually originated from the island of Capri (a gorgeous island off of the Amalfi Coast, a common honeymoon destination for Italians and a favorite destination of mine while living in Italy), but it did become popular after being served there to King Farouk of Egypt during the 1950’s. When I want to throw together an insalata caprese, like I did recently for myself and my fiance, I simply place tomato slices on a plate, put a slice of buffala mozzarella on each tomato slice, and put a basil leaf on top of each mozzarella slice. Add olive oil, balsamic vinegar, and salt, and you’re done. Some people also put pesto on their insalata caprese, which is also delicious. So, if you’re looking for a flavorful, colorful dish that’s easy to make and is perfect for beating the summer heat, thank the gastronomic genius of the Italians and make yourself a big plate of insalata caprese. And buon appetito. This morning at the gym, I turned on the news to see live footage of the riots taking place in front of the Greek Parliament building in Athens. Dark-haired Greek men and women faced off with tough-looking policemen bearing shields and tear gas, in an awkward dance where both parties tried to guess when or if the opposing crowd would make a move. I recognized that square in front of the Parliament building in Athens–I had gone there with friends back in 2006 on a tour of Greece. My friend Sy and I had crashed a Greek wedding nearby, on accident (we walked into a church where a wedding happened to be taking place, and we couldn’t very well just leave–it was a Greek wedding!) Sy, my other friend Ileana, and I had also explored the market in the square and really enjoyed the laidback feel to the Greek capital. It seems like the laidback feel also came with some risks. I remember a guide telling me in Greece that life there was great–you could retire super early and enjoy a generous government-funded pension, when you did work you received tons of government-subsidized perks, and you received a ton of paid vacation days. I definitely could not say the same for the U.S., and the Greeks definitely could not understand the concept that Americans barely get one or two weeks of paid vacation a year, if they’re lucky. In the end, sadly, Greece faced major deficits and saw their economy spiraling out of control. Today, June 29, the government had to vote on whether or not to make serious economic reforms. People were out protesting because, naturally, it was difficult to even fathom the reality of all the benefits they were used to being taken away. While trying to stay focused on my workout and burn off the ice cream from last night (red velvet ice cream if anyone’s curious–heaven in a pint), I thought about how much I had enjoyed Greece. Sy, Ileana, and I had taken our graduate exams at King’s College London and had gone straight to Heathrow Airport to catch a flight to Athens. We spent several days exploring the ruins of Athens, then took a cruise around several islands such as Mykonos, Crete, Santorini, and others. My favorite memories from Greece were visiting Patmos (where the apostle John, according to historical analysis, wrote the Biblical book of Revelation); strolling through the amazing Plaka shopping district in Athens and buying way too much; having a Greek boatman say, “Parakalo” with a toothless grin when I tried to use my pocket dictionary Greek and told him, “Efharisto” when he helped me off of the boat; riding a donkey down the caldera of Santorini; and the food. Oh, the food. I fell in love just with the Greek cuisine alone. Every morning I eagerly headed to breakfast so that I could enjoy a big bowl of Greek yogurt with fresh honey and pistachio, at lunchtime I couldn’t wait to dig into a heaping plate of moussaka, and about twice a day I had a craving for yogurt and honey ice cream. I remember making numerous trips to the market for fresh olives, stuffing my backpack with jars of Greek honey, and hauling away bags of fresh Santorini pistachio nuts to take back and enjoy in London. When I snapped out of my reverie, the news reported that they had received word on the outcome of the vote. The government did indeed go through with passing austerity measures, and it looks like Greece will face tax hikes and spending cuts in order to secure bailout funds from the IMF. Things are about to change in major ways for the Greeks. I hope that Greece is able to get its economic situation under control soon. It’s such an amazing, unforgettable place, and once you’ve been there, you understand why. Athens alone is unlike any other city in the world–once you’ve stood in front of the imposing Parthenon, all of those pictures in history books from your childhood come to life. And the islands…I could go on forever about the islands. In the meantime, as a country with such an incredible history, hopefully Greece will write a new chapter. One with brighter days ahead.